This post is about puppies. Puppies puppies puppies, puppies puppy puppies. 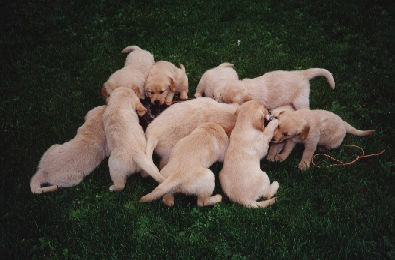 Puppy Puppy puppies puppies and puppies puppy: puppies puppies. Puppies puppies puppies puppies kitten puppies puppies puppies.... Puppies puppy? Jacob, can we have a puppy? Yes, my dear. You may get a puppy. Why don't you pick up the little fellow tomorrow before I come home from a hard day of catalyzing. It'll be just the lift to my spirits I've been needing. Why, Jacob, I knew your stubborn insistence that a puppy would be terribly impractical couldn't last forever. I'm so glad you've come around. You won't regret this. PS - I think you should also pick up an alligator. The pet store is having a special. Actually, the main reason for the puppies post is gene's (and michele's) background-changing hijiinks. It's sad to think that this post will turn into just so much surrealism when I change it back. Now how did you know I wanted an alligator? This is really too much wonderfulness all in one place. I'm putting on my shoes and heading to the pet store right now! Surrealism, as we all know, is not welcome on Cementhorizon. Sneakiness, however, is. Goddamn sneaky Jacob and his goddamn sneaky button. You'll get your comeuppance one day, Mr. Sneakypants, oh yes you will.